Gotta love the Green Dragon events! I was present with my Ksys, and I really enjoyed it from start to stop. Relaxing, fun, great people (hobbits) no boring moments. Cousin Fumbles and I enjoyed our first Friday at the Green Dragon today! What a wonderful way to spend a few hours. The ale was strong, the pie delicious, and the company was absolutely wonderful! Thank you all for making a pair of Buckland hobbits feel welcome. Definitely coming back. Pie, pie and more pie! There was plenty to go around yesterday, along with dancing and song. I've been away from GDF for a while, but now I've come back I'm enjoying it as much as ever! Thanks to all the hobbits that make this event such a wonderful, funny, welcoming experience. Grymrock and Uswin get hobbit feet tapping. The 'wizard' is back and gets confronted by a dwarf. Lina gets the hobbits hopping with her hopping song. Tired but happy hobbits make their way home to their burrows. Another wonderful night at the Green Dragon! The sturdy-looking chair next to the fireplace and the dancing rug can look very inviting after a few ales and dances. Should you take your chance and slump into it, though, the locals may cheer and demand a story from you. And there will be no way out unless you tell one. Traditionally the place where visitors took their seat if they wanted to regale the crowds with a story, lately the chair has seen less of this use, not least because most storytellers prefer the warmth of the fireplace nearby. The chair is also quite wobbly after a dwarf got his ample frame stuck in it one night and had to be pried out, once the hobbits grew tired of bringing ales to him. Because of this, a few of the regulars have taken to call it "the naughty chair" instead. Still, don't be surprised if an old hobbit snuggles into it and starts recounting dramatic tales of failed potato crops, how strawberries used to be much sweeter sixty years ago, and don't yer shush on me ye young rascal! Some doubt has recently been cast on the authenticity of this chair. I have done some research - including some searching questions of Barmy - and I am in a position now to state that, despite having been repaired from time to time, specifically with four new legs, three new seats, and two new chairbacks, this is undoubtedly the original and authentic story chair. Last edited by Charlock; Jun 23 2011 at 05:45 PM. A hobbit's work is never done, it seems. Here I am (I'm Sevelda, Slug-Squasher Extraordinaire!!) getting things ready for baking some pies before the start of the gathering at the Green Dragon Inn. I got drenched in the thunderstorm but I managed to get the blueberries ready! That dwarf was back, but there was no wizard to confront this time. No ducks showed up either. I am disappointed two times over in that regard. FIREWORKS! And they were set off on top of the roof this time, instead of under it! We're getting better!!! Hobbits enjoying an impromptu musical performance after the fireworks. That would make it a Green Dragon Breakfast! Please, please, please share with us some of the Aussie folk tunes. There has been a thriving folk revival in the last few years (I think it said Melbourn in the article I read but it was about 6 months ago and I have trouble remembering what I did yesterday). I for one would love to hear something "new" and maybe do a little .ABC trade. Enjoying the Green Dragon events alot! Might even work up the courage to play some tunes....dont ask for a riddle though the brain power at that time of the morning is still low current. I might not be talking much but i usually have enough energy (just) for the hippity hop! Looking forward to saturday morning!! Last edited by Harbut; Jun 27 2011 at 06:03 AM. I think we can do some business. I'm working pretty actively converting some .ABC's including some 'patriotic' songs for Mar Nu Falmar. I'm going to try and smoothtalk Harbut into doing a duet with me for next Green Dragon. That is if I can wake the dopey bugger up. Last edited by Dittany; Jul 01 2011 at 02:39 PM.
? J.R.R. Tolkien, The Hobbit. It's tonight Folks, get yourselves ready for an evening of dance, song and merriment. I might play a tune or two, if I get the chance. If not, I'll enjoy everyone elses tunes. Once again an incredible evening. So friendly and so busy! Poems, songs, dance lessons! Thanks all for your contributions, I had a wonderful time. A dwarf plays a melody while the hobbits, a burnt lady and a tall fellow look on. Bootsy plays while guests dance. Mason, Uswin and Grymrock give the hobbits a taste of their music. 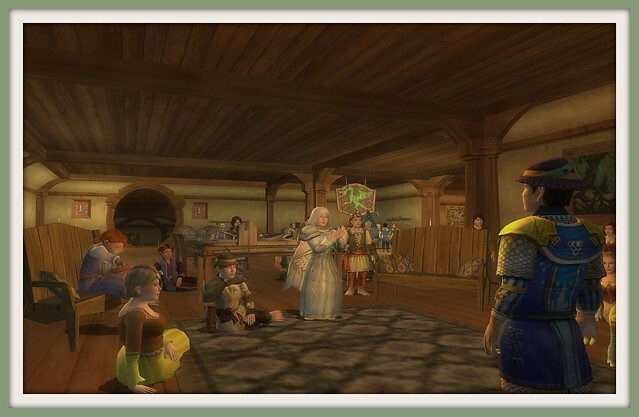 Simbo gives a dancing lesson outside the Green Dragon Inn. Lovely photos as always. Your great eye never ceases to impress me. With apologies to all the other races, here are the Lyrics to the "Bounder Marching Tune" sung by Moxsie at the last Green Dragon. Its sung to the tune of Skedaddle (a US civil war tune), coming soon to a fatlute near you. The Green Dragon has always been well attended by the local hobbits, but Fridays were often on the calm side. Things improved considerably when the innkeeper, Barmy Rootknot, hired a lute player a few years back to bring the crowds in. Always a shrewd businessman, Barmy figured the increased ale sales would soon cover the musician's wages and then some. As always in matters of money, he was right. The visitors like little more than to complain about Barmy, given his general stinginess. Recurring topics include the watering down of ales (not likely true), increased prices (very likely true), and the fact that he hasn't yet gone about to replace the worn-out rug near the fireplace in the entertainer's corner (absolutely true). Still, everyone comes back the next Friday anyway, because Barmy runs a solid establishment, serving up quality ales and a lively atmosphere. 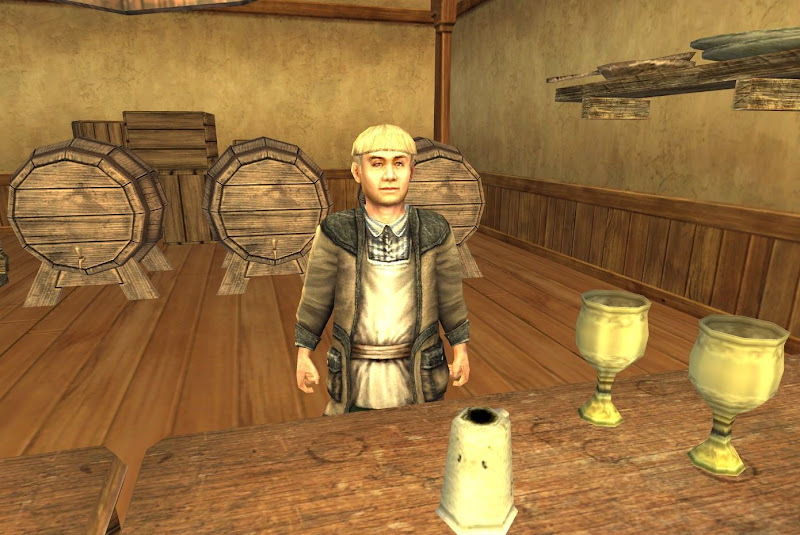 And no matter how your day has been, he's always there to greet you with a friendly smile and a foaming ale. Just make sure to pay your bill before leaving. I was a first time visitor to this afternoon's (for me in PDT) 'Green Dragon Friday'. Thank you, Lina et al, for the excellent music, dancing, and stories. I had an excellent time and hope to be back again. It's that time of the week again where us Hobbits kick back and relax in the Green Dragon. Lots of fun with music, song, dance, poems or stories. So put on yer best dress or suit and come along for an evening of Hobbity fun. I had so much fun yesterday, even though I didn't speak much (being shy, and fairly new to this much RP). Cannot wait for the next one, as well as the concert happening on Sunday. Not sure if I'm going to go on hobbit, man, or elf. 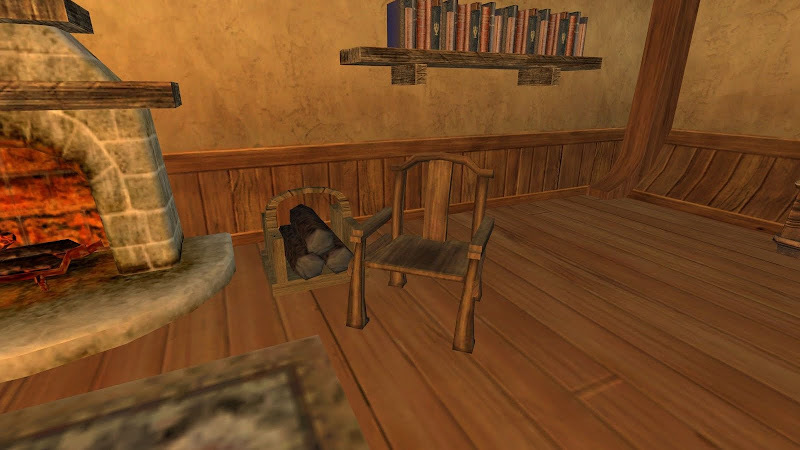 There are two fireplaces in the Green Dragon. On Fridays, almost all hobbits meet at the fireplace near the entertainers and the dancing rug, and things can become very busy indeed. The other fireplace only gathers a handful of locals, usually found muttering about all the noise from the other corner of the inn and how this never would have been accepted when THEY were young, whenever that was. Should things get too hectic and rowdy near the dancing rug, the other fireplace is a good place to bring a few friendly hobbits for a quick breather and some in-depth conversation. Bring your ales along and relax. Last edited by Linawillow; Jul 29 2011 at 08:08 AM.